For those of you who receive tens of texts per day, and hundreds per week (nudge, wink, average American teen), the stock text messaging app that comes with their phone is probably already feeling overburdened, cluttered and terrified it can't sort it all out. 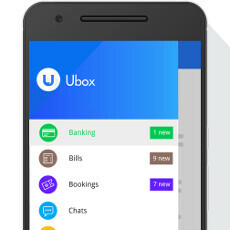 Enter Ubox - a new texting manager that would try and sort those hundreds of texts for you, serving as a sort of organized email inbox, but for SMS stuff. It would place promotional messages in one Promo inbox, so you don't have to delete them to get to the important stuff, related business messages in another, the messages you get from your bank in a third section, chat sessions with your friends in dedicated place, and so on. The separate inboxes are be color-coded, so you will know quickly where to go if you are searching for a particular text. Important messages can be bookmarked for a quick access later, too, while spam texts can simply be swept away. Check Ubox out if you are in need to "reclaim your inbox." Well, their song was very Googley. I'll give them that. not compatible with any of my devices! Seriously? Good luck developer. I don't know what is so special with this app most of my devices are pretty recent.